I was in a dollar store in Vancouver when a piece of music came on the store radio which I immediately recognised. Not in that usual way where a pop song starts up and you’re absent-mindedly humming along, but in the way where you hear a piece of music so deeply associated with a completely different context that reality feels a bit wobbly. It’s like your dad’s voice coming out of a cat, or something. Anyway, ringing forth in the socks-and-earphones-and-facemasks-and-noodles aisle was some of the background music from Megaquarium. 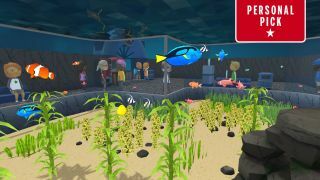 Megaquarium is a fish-centric theme park management game by Twice Circled, the tiny studio behind Big Pharma. I actually had to leave the shop in the end because I was so confused by the fact I wasn’t laying out theme park walkways and arranging fish in tanks that best suited their needs. I have played dozens of hours of Megaquarium. Over the course of those hours, the music has become so deeply entwined with a particular set of activities—tinkering with aquatic plants, refining filtration systems, shifting my branded fish balloon inventory—that hearing it in another context immediately triggers the impulse to play. The aquarium theme immediately sets it apart from other tycoon-style games. I love fish and visiting aquariums so the chance to run one in a game was a rare and exciting treat. That theming also meant it didn’t have the pressure of needing to compete in a more crowded niche. You’d need to work hard to stand out in the world of rollercoasters, or to go toe-to-toe with hospital or city management projects, but Megaquarium is able to simply co-exist, throwing a new setting into the mix. The main appeal for me, beyond the fact that aquariums make up a large part of my non-work life, is that Megaquarium succeeds in inducing that wonderful, relaxing cycle of play I associate with tycoon games at their best. 1. You set up a space. Tycoon games are really tinkering games. They’re projects which always have room for improvement. Manageable improvement. The kind of ongoing improvement which takes you from a single room with a single tank, to some kind of sprawling fish palace entirely by repeating the phrase “I’ll just do this and then I’ll log off” over the course of an evening. I booted up the game to help me write this piece and I’m already accidentally re-housing my green moray eel to repurpose its tank for the newly unlocked red leg hermit crab. Y’see the eel is fully grown and will eat the crab if I put them in the same tank. But the crab needs to be in a tank with something as it’s a scavenger, meaning it can’t be fed directly. Instead, it nibbles the remains of another creature’s food. Perhaps if I add some spotted boxfish? But then is there enough going on in the eel’s new tank to keep visitors interested? And this is how it continues. A wonderfully relaxing procession of “What if…. ?” and “Let me just try…” which expands to fill an evening.